Asia is confronting a big economic and social obstacle: Population Ageing. When some are quite pessimistic about the consequences of this reality —the shrink of the labor force compared to the growing elderly population, no money for pensions etc. — some entrepreneurs, organisations and countries such as Singapore perceive it as a great opportunity. The elder care market is indeed one of the fastest growing sectors in healthcare in Asia, Europe, and the Americas. Therefore, contributing to the growth of businesses that will help to improve the lives of the elderly makes both a lot of economic & social sense!This is what motivates organisations such as Ageing Asia or ACCESS Health International to help create new business in Singapore that serve the needs of elders and their caregivers. But how do you convince the “startup kids” and entrepreneurs who are so focused on cool trends & youth-centric ideas to take a step back, and look at the topic of ageing? Why not even go a step further an look into employing or collaborating with a different generation? Using our storytelling skills, we’ve been helping ACCESS Health to reach out to communities of elderly in Singapore as well as (aspiring) social entrepreneurs. Over years, Asia has reached a rapid economic growth but also the fastest ageing rate. People are richer and live longer but the quality of life is not always following. According to the Asian Development Bank, Asia has to find solutions to support a rapid economic growth in the face of less favorable demographics, which implies slower growth of the workforce. Second, Asia must find ways to deliver affordable, adequate, and sustainable old-age economic security for its growing elderly population. Singapore is taking these trends seriously into account. Recently, Lee Hsien Loong – the Prime Minister — announced a $3billion action plan to enable Singaporeans to age successfully. The amount will be allocated between 12 areas, namely, health and wellness, learning, volunteerism, employment, housing, transport, public spaces, respect and social inclusion, retirement adequacy, healthcare and aged care, protection for vulnerable seniors and research. Participants of an workout session for elderly in Singapore at ASPIRE55 — Ageing Asia. Credit Photo: Mathew Lynn. 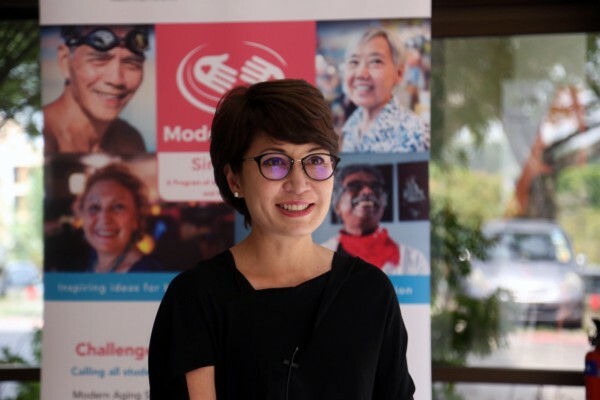 “Delivering economic, physical and emotional security for the elderly” is what motivated ACCESS Health International Singapore to create a regional educational program, incubator and competition called Modern Aging based out in Singapore. 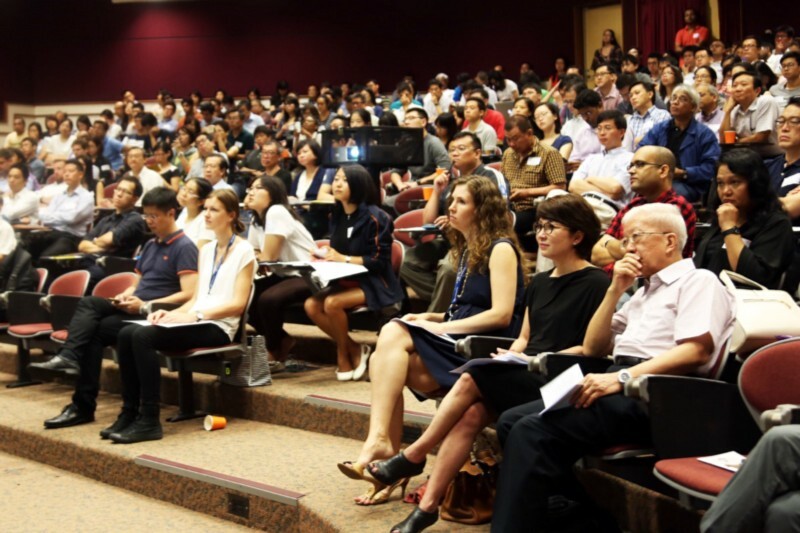 Co-organised by NUS Enterprise (the enterprise arm of the National University of Singapore), the program is also supported by Duke NUS, the Ministry of Health and was launched by the Minister for the Environment and Water Resources — Vivian Balakrishnan himself. The main purpose of the program was to build a strong community of entrepreneurs / organisations willing to create new businesses targeting the “Silver Generation” and to see theses businesses being successful in the next 2 years. The program has helped participants to understand elderly related issues and how the elderly today differ in lifestyle and preferences compared to previous generations. Aspiring entrepreneurs have then been able to find ways to respond to elderlies specific needs. The program also included a competition that happened from August until December 2015. Initially, more than 500 people signed up to the program that received 96 business ideas. At the end, 20 teams were selected and formed. In all, people coming from various nationalities and backgrounds — business, design, business, architecture, public health, art etc. — attended the workshops, boot camp sessions and conferences. During one of the Modern Aging bootcamp sessions in October 2015. Teams Altrue, Pillpresso and SoundEye were the top teams out of almost 100 which had participated in the competition. The top two co-recipients — Altrue and Pillpresso — were awarded S$50,000 each, while SoundEye was given S$25,000. While Pillpresso is a smart electronic medicine dispenser that aimes to make medicine consumption hassle-free and prove patients’ compliance with medication regimens. Altrue is developing sensors to protect bedridden patients from pressure ulcers and infections. Teams Altrue, Pillpresso and SoundEye during the Modern Aging Grand Finals on December 4th 2015. 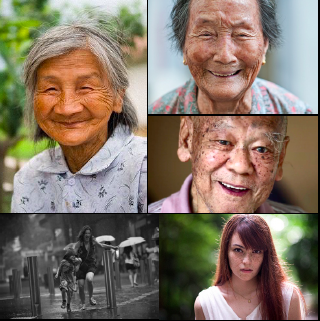 One of the main objectives of Modern Aging is to challenge the perceived negative connotations towards ageing, and try to inspire young & aspiring entrepreneurs to get more interested in ageing in Singapore and South East Asia. This is why, we helped to plan and design a communication strategy for the Modern Aging program. We created media content to promote the program, to drive participation and to engage different communities around ageing throughout the program.We also enabled ACCESS Health to leverage on these connections and network in order to find participants, speakers and communities interested in aging. Our idea was to change stereotypes related to the elderly who are often associated with weakness and illnesses. We wanted to tell a different story by showing that elderly people can also play a fantastic role in our connected world; that we have a lot to learn from their experience and wisdom; that older generations are funky! Indeed, despite the elderly living longer and stronger, and the younger generations like us are getting “smarter” with new technologies — we tend to leave the elderly behind instead of integrating them in our lives, societies and innovations. 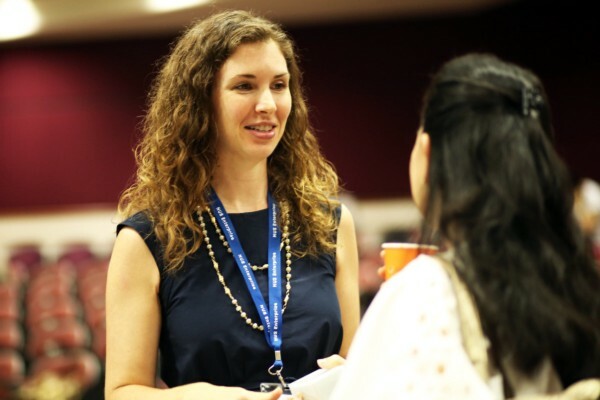 Adrienne Mendenhall, Country Manager, ACCESS Health International Singapore. Angelique Chan, Director & Associate Professor Duke-NUS. 1 —’ Block 12, My Territory, My Dignity,’ a photo series created by a local photographer Lavender Chang who investigated HDB’s one-room studio. 2 — Breathtaking ‘Street Portraits’ by a local & very successful photographer — Danny Santos who is playing with natural light and soft contrasts in order to sublime people in the street. 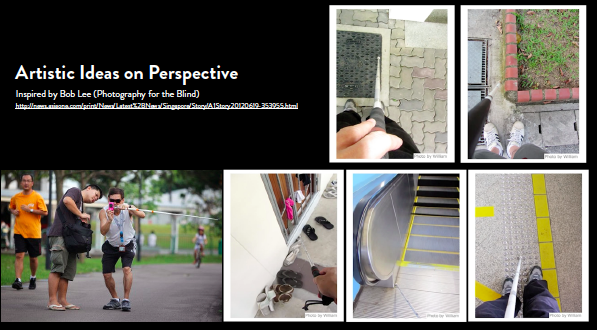 3 — ‘Photography For The Blind’, by Bob Lee who teaches photography to the blind people. His work made us thinking about perspective in photography and video. How our perceptions and sens are changing when we grow older and we are handicapped? Bob Lee, Photography for the blind. 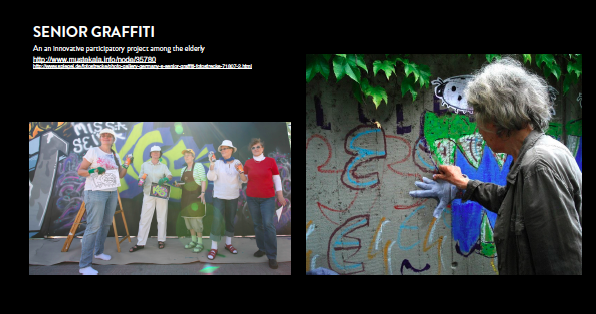 4 — ‘Senior Graffiti’, an innovative participatory project among the elderly. Senior graffity, educational innovative project. 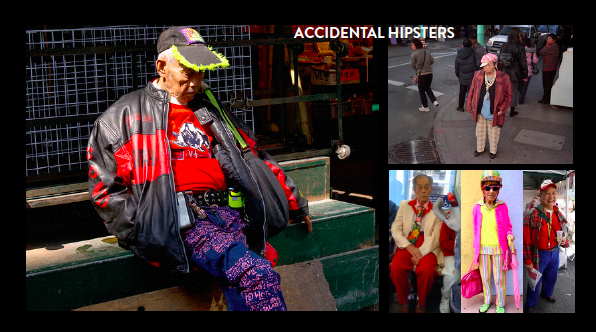 5 — ‘Accidental Hipsters’, to get inspired by funky people from the pioneer generation. 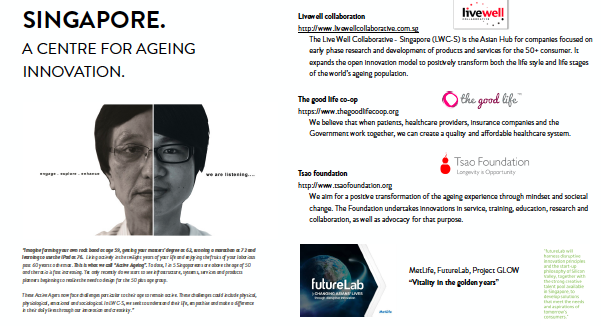 6- Organisations / Foundations such as LiveWell, The Good Life or Tsao Foundation who aims to make the ageing experience positive. 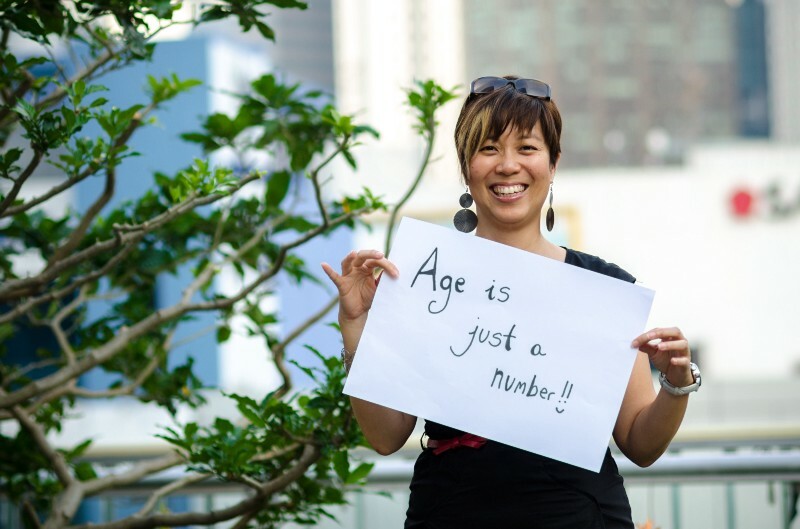 7- ‘Ageless Online e-magazine’, Eleanor Yap has built one of the most comprehensive e-magazines for seniors, Ageless Online. We also met inspiring wise people in their sixties and plus from whom we should all learn. The amazing people we met included a Vinyl collector, Musicians, Tango Dancers, Swimmers and Body Builders, Shoe cleaner, Tissue Sellers and more! This is Joseph, 61 years old, one of our Modern Aging heroes in Singapore. He’s one of the biggest vinyls’ collector in Asia. He’s also the author of ‘Apache Over Singapore’ and ‘Beyond the Tea Dance’, both stories of Singapore 60s Music. He welcomed us to his house full of vinyls, we filmed and interviewed him, he gave us happiness and hopes that we’ll be able to party until we die. Rufino Soliano was born on January 10th 1932 in Singapore. He has been among the most active musicians and composers of the local scene in Singapore. Former head of the Singapore Broadcasting Corporation Orchestra, Rufino can play the violin, drums and percussions. In 2013, at the age of 81, he released his debut album of 12 original songs. Rufino welcomed our crew to his house together with his family (4 generations in total). Giusy was born in Italy. 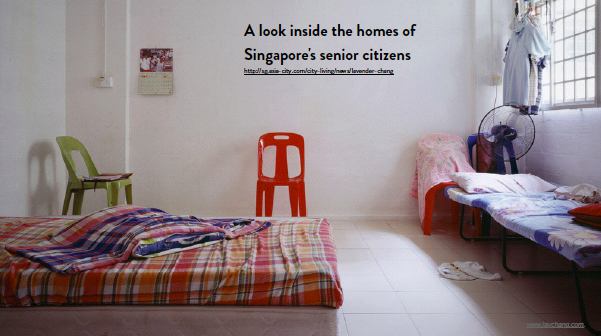 After her husband died 5 years ago, she followed her older son in Singapore. She decided to keep being active through her passion — dancing. She chose tango as the tango community in Singapore is big and very welcoming. Robert arrived in Singapore in his late 30s, coming from Hong KOng. He’s part of a community — The Strong Silver — that organises workout sessions mixing elderly and young people. Robert is impressively fit and strong. Last December, he run the Standard Chartered Marathon and completed the circuit in 1hrs15mins, NEVER TOO OLD. If you’ve ever walked in front of 313Somerset, you’ve passed next to Kan Kau Tal who is a shoe cleaner. After he retired, he started this job to complement his pension and to send money to her daughter who is studying in Taiwan. It’s an American friend — Alek — who introduced us to Chow Ah Chai. Alek has been living with Chow Ah Chai for 5 years in when he arrived in Singapore. Chow taught him Mandarin and how to play harmonica. Alek is now fluent and often sees his favorite uncle to share a meal with him. Noo has been selling eggs at the Tiong Bahru Wet Market for most of her life. She’s now handing over her business to her children. Raymond has a fruits stalls at the Tiong Bahru Wet Market. He’s Noo’s neighbor and manages his stall together with his son and daughter in law. Chin Yuet Mui confessed she’ll never stop working. This is what keeps her active! It’s been an incredible experience working on this project over the last year and we can’t wait to continue. Everybody will grow old, it’s now a matter of knowing what kind of future we want to create for the generations of elderly to come. Ageing is not an identify, but it is a process that can be positively and smoothly experienced if we find relevant solutions to meet with the elderly’s needs both locally and globally. If you’re also passionate around ageing, feel free to reach out to us or to register to the next Modern Aging Program. Also, keep posting pictures on instagram / Facebook etc. using #modernaging!! We are no longer active in Improving the Lives of the Elderly, Medium. Projects and resources are available in the archive.